I've added a slideshow in the right hand side there of some really creepy old Halloween photos. This guy's posting one every day until Halloween here. Didn't I say I stood by my predictions? It's not over yet. Of course, when was the last time a team came back from being down by 7 or more runs in a post season game? 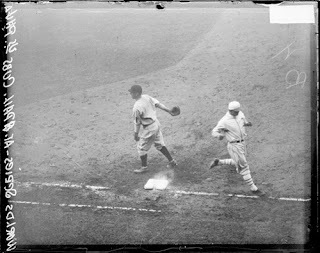 When the Philadelphia A's scored 10 runs in the 7th inning to beat the Cubs 10-8 in game 4 of the 1929 World Series. Ouch.